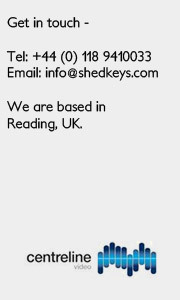 ShedKeys designs and hosts websites from as little as £99 for a simple, 1-page site, right through to larger websites with multiple pages and more detailed information. We can also create Flash websites, and incorporate video and animation if you need that sort of thing. We also provide helpful and professional support, and can help you maintain your website throughout the year. Professional production designer - GedClarke.com - showreels and videos embedded within the website in a clean, professional design. Freelance photography site - Mary-Lou Photography - includes a photo gallery, and some Flash animated slideshows of the client's work. Self-employed cameraman - Video-Cameraman.co.uk - numerous pages of information, and some video's. If you have any questions, or would like to know more please get in touch (contact info on the right). © 2011 Shedkeys.com - Site designed by Matt Clarke.